The theme of the Paso Robles Festival of the Arts, 2012, is "Local Color: Celebrating Authentic Beauty." Truly, beauty was everywhere. There was so much to see and do and hear at the festival that one person cannot take in everything in one day. This video is a sampling taken from several hours of video I shot over two days. It is a video collage of the art festival from my own perspective. In the paragraphs below, you will find explanations for many of the scenes in the video. You might want to save the video for the end, or stop it if you don't understand what you are seeing and see if it's explained below. The City Park in Paso Robles is the center of most annual festivals and season activities in the City of Paso Robles. 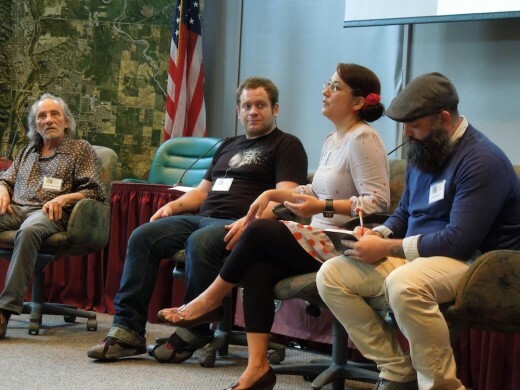 On Friday afternoon, I attended a panel discussion called "Don't Feed the Artists" moderated by Ashley Schellenbach, managing editor of the New Times. I have a fragment of that discussion here near the beginning of the video. Panelist David Settino Scott, San Miguel painter and sculptor, answers a question about the difference between modern and contemporary art. I will be writing more about this discussion in a separate article when I have more time. What's important to note here is that this fragment came from over an hour of video, and that's how I have to portray the entire art show -- in fragments. 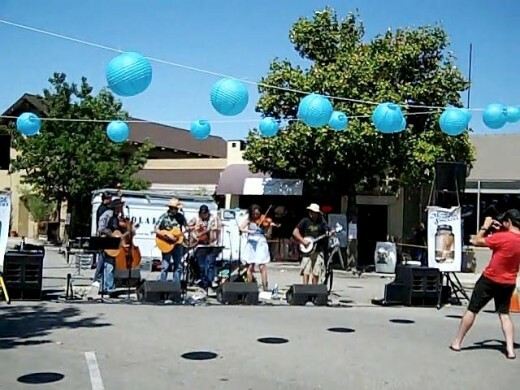 The Paso Robles Festival of the Arts event has several zones. The Outdoor Fine Art Show and Sale is closest to Pine Street and Studios on the Park, which has exhibits that are also part of the entire event. In fact, Anne Laddon, found of Studios on the Park, and Sasha Irving, its manager, are the main organizers of the art festival. On Pine Street, between City Park and Studios on the Park, the street is blocked off and there is a wide walkway at the center for people wanting to go back and forth between them. In the center of the block is a makeshift River Lounge where beer and wine may be purchased. The Mother Corn Shuckers group spent a good part of the day performing their music at a volume that could be heard through most of the art exhibits nearby. You will be overhearing them in the video and seeing them play for a few seconds in the street. I cut the volume a bit in the video so it would stay in the background. There were other street performances, as well. I captured Paul and Randy Rigby playing and singing near the 12th Street entrance to the park in the early afternoon. Later in the day I taped a bit of Don Lampson's music there. Please note that I only captured fragments of the music to give you the sound of it, but copyright regulations prevent me from recording entire songs. I spent most of my time at Studios in the Park in the afternoon, but did manage to record a bit of the Central Coast Love Notes singing "You are my Sunshine," Aurora Denny playing her harp, and Cindy Dixon providing some easy listening music on the piano. I want to give credit where it is due. Although I didn't find it in the program as a scheduled performance, you will see Justin Thieleman demonstrating the use of the diabolo, or Chinese yoyo in the video. I will publish a separate video of this later, since it was something I'd never seen before. Justin will be teaching a class in this at Artistry in Motion and you can contact him through that organization. He is also a drame instructor at the Paso Robles Youth Arts Foundation. The Great Divide between Zones is the Carnegie Library, on the steps of which the Plein Air Painting Auction was held. In the video you will see me talk to one of the Plein Air Quick Draw Entrants, Jeremy Harper, about his painting. 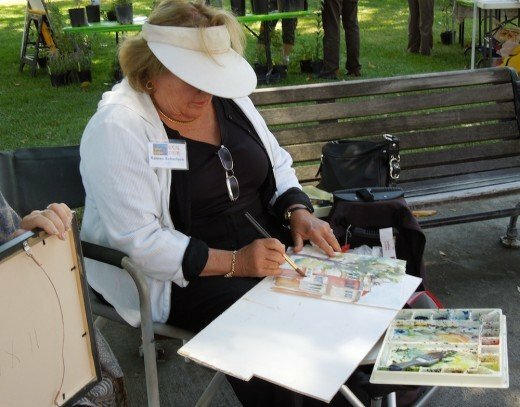 The entrants in the event had two hours in the morning to create a painting of something within walking distance of the park. 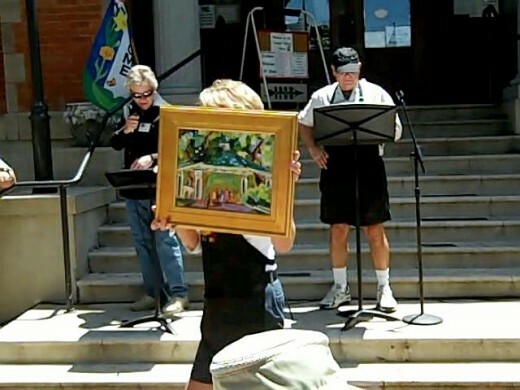 The paintings were then displayed on the main walk from the fountain to Carnegie Library for about two hours until they were auctioned off to the highest bidders on the steps of Carnegie Library. Right before the auction we meet Norma Moye, who heads the Paso Robles Downtown Main Street Association. You can't live long in Paso Robles and attend city events without meeting her. She is normally greeting people as they enter events held at the city park. You will also meet Barbara Partridge, who chairs the Festival of the Arts and welcomes you right before the auction. Next you will meet Stephen Doherty, editor of the print and digital editions of Plein Air Magazine. 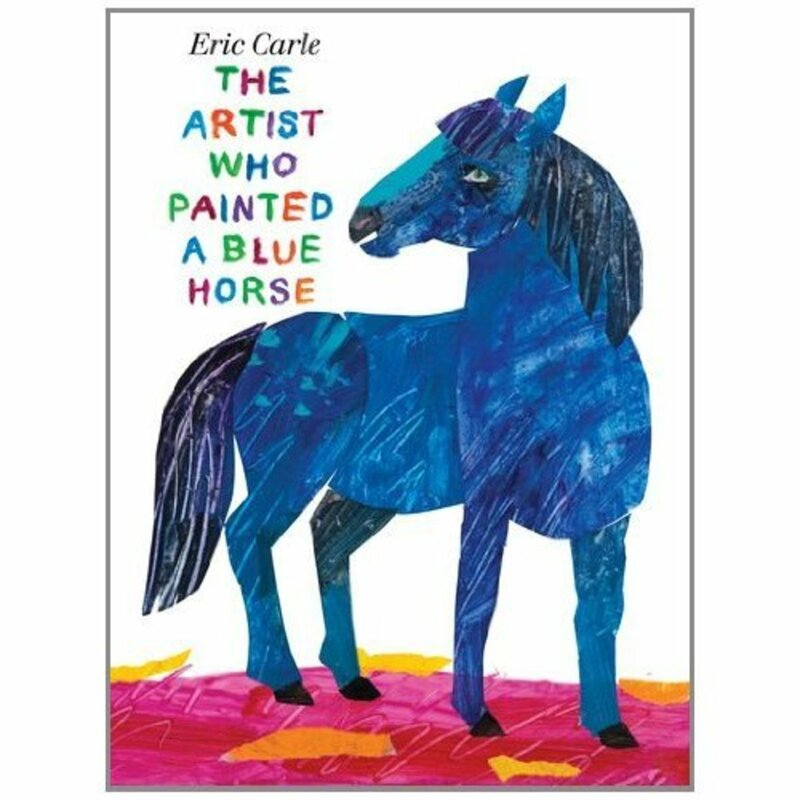 He has also written hundreds of books on artists working in many different media. He made the awards for the Quick Draw Competition just before the auction started, and you will see the winning paintings in the video. The auction itself is a high point in the day and began at 1 PM. The main auctioneer was former Paso Robles mayor and current Country Supervisor Frank Mecham. Helping him was winemaker Doug Beckett. The auction itself lasted about an hour, so I picked the auction of just one painting to include in this video. I wanted to show you Frank's antics in getting bids and let you be part of the experience. With 61 art booths in the park, I'm bound to have missed some. There were also artists that did not want photos taken, so they were excluded by their choice. I have zeroed in on some artists but there were only so many I could get in one video. I will be doing longer features on some of them as time permits and linking to those articles. The video itself tries to give you the flavor of the event as I saw it with as many sounds and sights as I could fit in to give you the most variety. The order is random, as it was hard to remember when I saw what, and except for scheduled events, exhibits were pretty much the same all day. 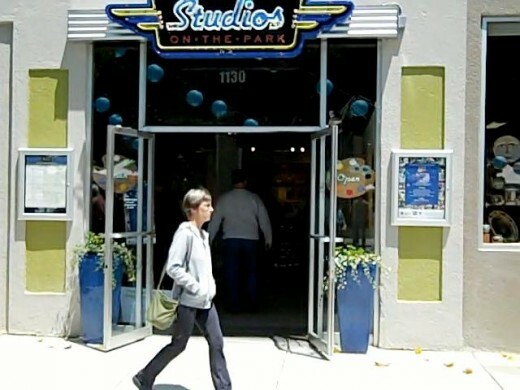 Any scenes that are indoors take place at Studios on the Park. There were two exhibits there which are continuing for a little longer -- "Local Color" and "Plein Art Masters." The individual studios also have a lot of art on display on Thursdays through Sundays, so if you did miss the Art Festival, there is still lots of art to see. The Phantom 2 Gallery will also last until June 2, 2012. It was not officially part of the Festival of the Arts, but was right across the street and it remained open four hours later than the main event in the park. 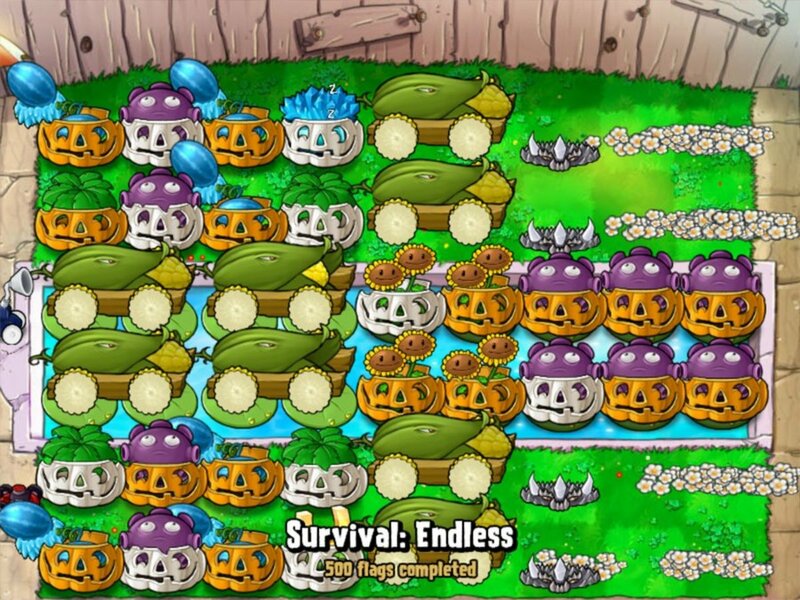 If you did not get there, I have covered the event in another hub devoted to it. This hub is truly a hub in every sense of the word, since it will serve to anchor all the spokes to the more detailed hubs on different aspects of this festival. I have much more on the birds of prey who were featured here. Many people want to see all of the art auction and more on the Quick Draw event. More details are coming on the portion of the show at Studios on the Park. There are individual artists I also want to feature. So stay tuned. 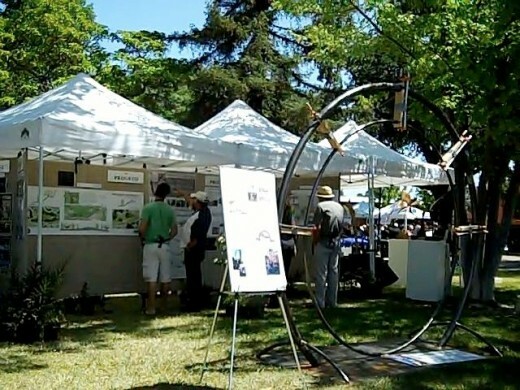 Toward the middle of the park, near 12th Street behind the artist booth section, was the environmental zone, which was devoted to organizations promoting environmental awareness. The REC Foundation and City River Vision Exhibit lets people create poetry or thoughts using words in a tray and the thoughts are written and collected for others to see. Behind it is a project board with a mural of the plan for the Expansion of the Salinas River Trail. Part of the proceeds from the Art Festival support the Salinas River Project. As Don Lampson sings in the video, I start to walk toward the back of this exhibit where the environmental sculpture of Robert Roemisch is featured. That huge circle you see there is "The Circle of Life." 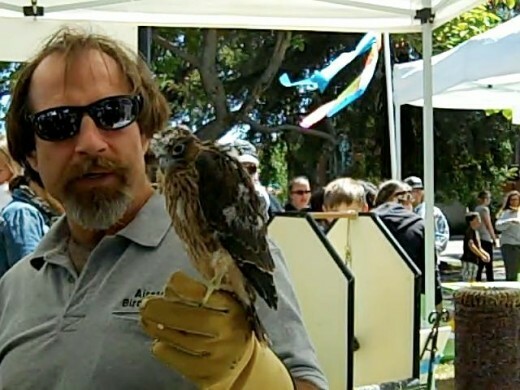 The environmental booth where I spent the most time was the Falconer from Airstrike Bird Control exhibit. 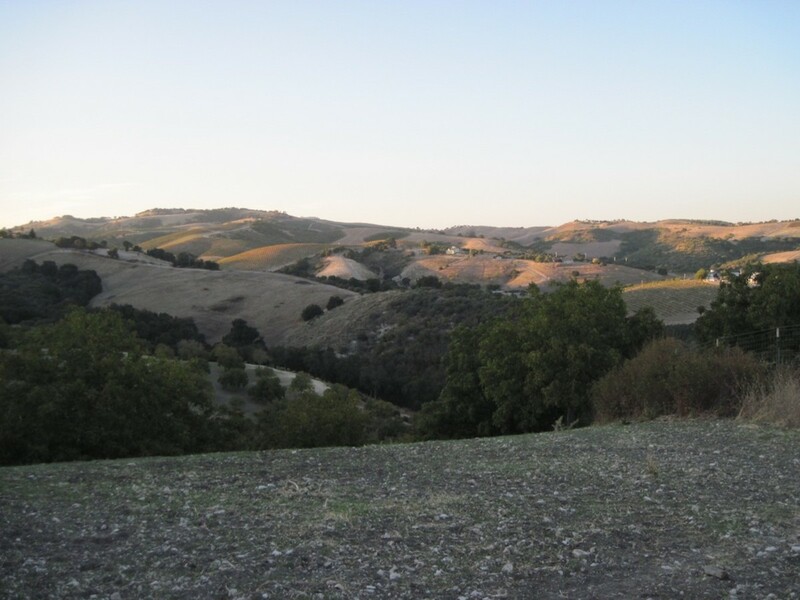 The falcons and owls are trained to naturally eliminate pests that destroy farms and vineyards. Those interested in sustainable farming might want to look into falconry as an option. 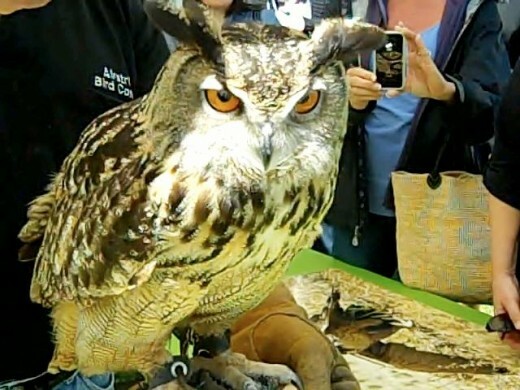 In the video, you will learn more about both the falcon and the owl pictured here. There were some booths I just didn't notice or recognize on my walk through. One is pictured in the video, and I believe from the part of the sign visible in the video it is the Upper Salinas / Las Tablas RCD. You will see it as Native Soil Paintings handing on lines, waving in the breeze to dry. 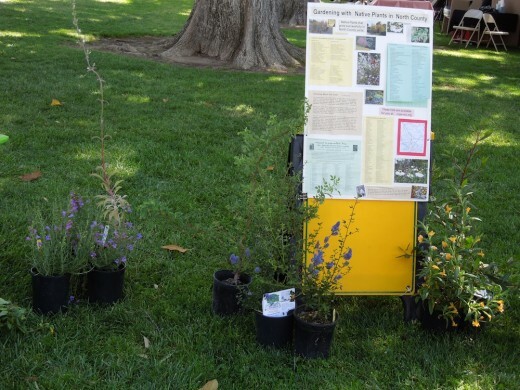 This booth was demonstrating the diversity of California soils. I wish I'd had more time to spend there, because the subject is interesting to me. Maybe next year. 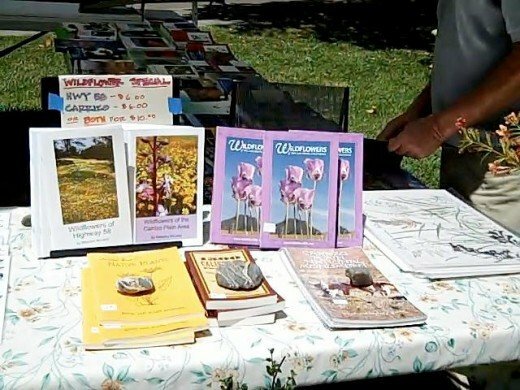 I spent a lot of time looking through the book table provided by the California Native Plant Society. Children were able to make "Leaf Art" in the booth, but I was so occupied looking at the books I didn't notice it. It's the best display of books on California native plants and wildlife available locally, in my opinion, though I did notice some of the books in the Historical Museum in the Carnegie Library. Transition Paso Robles appeared to be concerned with helping homeowners do something more productive, such as growing vegetables, with at least part of their lawns. So it looks like citizens of Paso Robles may not have the problems encountered by Julie Bass in Oak Park Michigan. 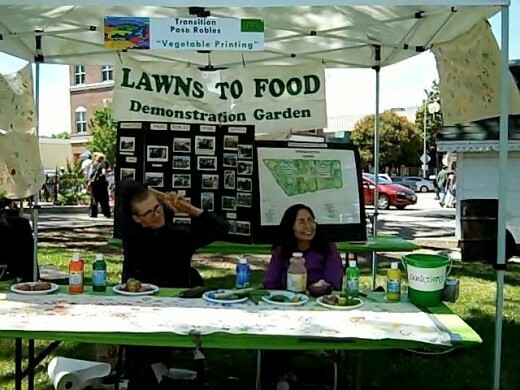 The booth also provided a "Vegetable Printing" activity for children. You can see the materials ready for children to use at the front table of this booth. You can see the children creating their vegetable prints and participating in all the other activities in the Children's Zone in Art Festival Activities Inspire Children to Express their Creativity. 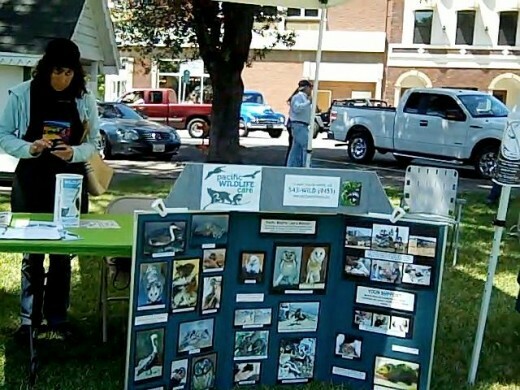 The Pacific Wildlife Care exhibit had interactive wildlife demonstrations and discussions. I saw an American Kestrel, and would like to have shared it with you here, but the video would not transfer into the video editing program for some reason, and I did not take a still picture. The American Kestrel, also known as the "Sparrow Hawk," is the smallest member of the falcon family. I won't go into much detail here on the children's zone. The video begins with an environmental activity that children loved -- sand sculpture and sand play. The Travel Channel's Sand Masters built a "Fish Castle" with some help from anyone who wanted to get involved. I suspect this was one of the event's most popular activities, even if it wasn't in the children's zone. The only official children's zone activities I captured in this video are the public mural and the musical petting zoo. If you want to see the other children's activities, I recommend using the link in the previous capsule, since that article is devoted to children's activities. 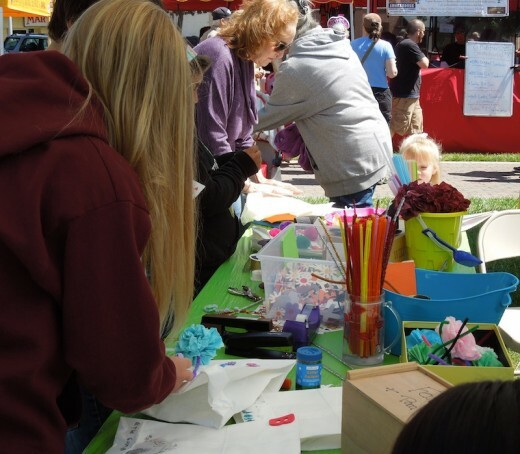 Those activities included face painting, stained glass art, pointillism, a rose petal pool play area, an "irresistible chalk resist," "blow art," and making zazy hats. 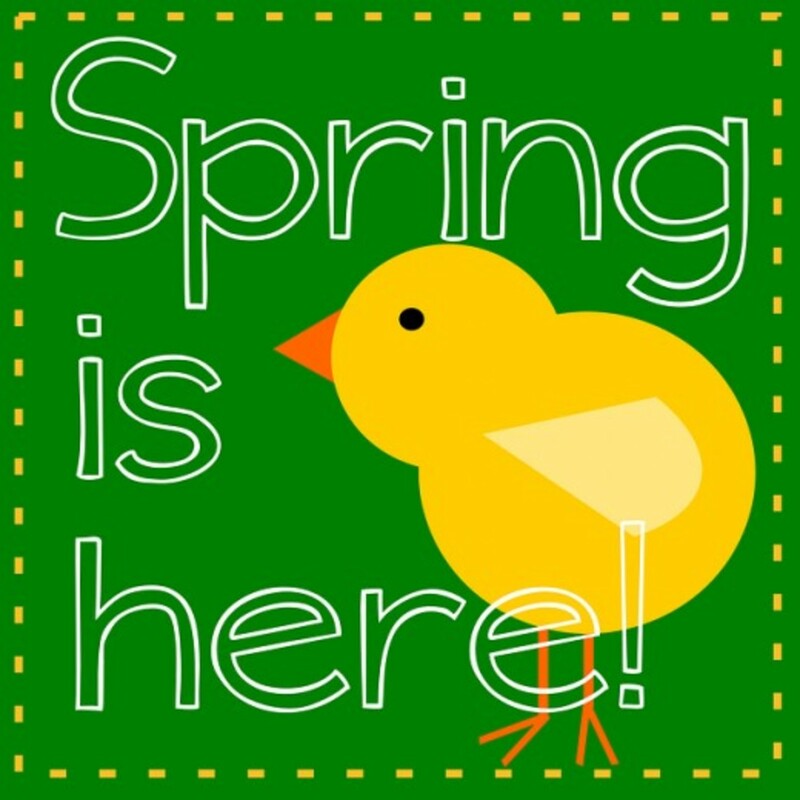 That includes the Paso Robles 2012 Festival of the Arts. I hope you've enjoyed this sample enough to want to come next year. Meanwhile, we have a very busy community of artists. Those who live in San Luis Obispo County can pick up a copy of the New Times free almost anywhere in your city where lots of people gather. It has a complete schedule of local art events. I'm convinced that even if you wanted to attend a different event every week, you'd still have to make choices. If you live somewhere else, you probably also have artists creating interesting and excellent work. Look for local art associations and see what they are up to. If you have a special sort of art that interests you, there may be a county or city association for that, too. If your city does not yet have an art festival, why not see what you can do to make one happen. 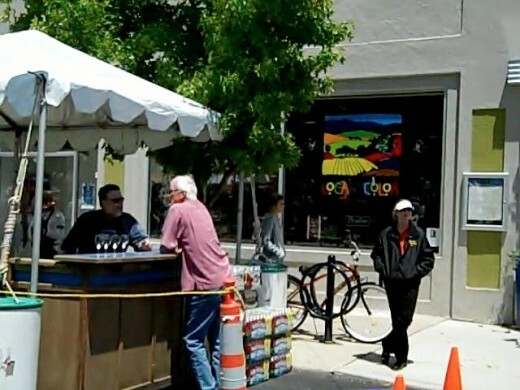 The annual art festival has become truly a treasured event here in Paso Robles. We have a beautiful environment here, girlshoptalk, and many of the painters, especially plein air painters love to go out and paint it. The photographers also find a lot to shoot here. Actually, the family connection wasn't mine. I met the mother of two of the artists I often saw in their studios but had not officially met. Then the daughter walked in and I was officially introduced. She's a potter married to another potter. Sound like an interesting family to write about. I've also discovered a musical family that sounds interesting. Rosemay, tonight I went to the closing reception of the Phantom Gallery, which was an informal part of the Festival of the Arts -- related and across the street from it but not officially part of it. I finally met an artist whose paintings I've been following, met an artist whose work I hadn't really noticed before and discovered a family connection to some other artists I've often seen, talked to a professional photographer about things happening in that field I was completely unaware of, and also talked to one of the musicians who was in the video about his field. The busiest art month of the year is finally over, and now it's time to compile all the data and make some spokes leading out from the hub this article is to more art articles. Thanks for joining me for the festival. Wow what a fun packed hub, I enjoyed taking the tour with you especially listening to the music. You did a great job with the video. I love visiting places like this, the celebrations bring out all the various artists and make it so interesting. Hyphenbird, I'm glad the videos make you feel that way. That's what I intend for them to do -- give people a taste of actually being there. Hubs like this are so interesting and educational. 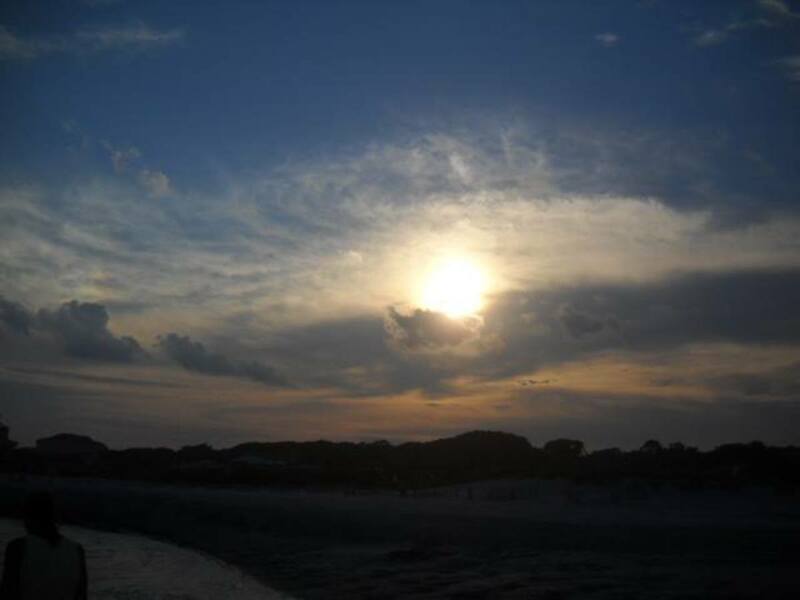 Your photos make one feel like they were there. I miss being able to travel and always enjoy these virtual visits you give me. Lisa, it always helps when you know one of the musicians, and you did. Thanks for commenting. Awesome! It feels like I was there...great variety and lots of interesting information. I especially liked the musical pieces of the video...but that's just me.